You know the real estate adage. Location, location, location. Four Star Freightliner has six stores: Montgomery and Dothan, Alabama; Tifton, Valdosta, and Albany, Georgia; and now, Midway, Florida. Its dealership had built up plenty of local business over 14 years at Capital Circle Northwest. However, the Tallahassee store was unable to capture the national truck traffic passing through North Florida on I-10. For Jerry A. Kocan, Four Star Freightliner’s dealer principal, it was time to move. Two years ago, Kocan hired a broker, Johanna Money, to help him find a site with clear highway visibility. They looked to move elsewhere in Tallahassee but with relatively few interstate exits, their search was limited. Money reached out to Beth Kirkland of Gadsden County Development Council, who helped Four Star Freightliner find a home nearby, off Exit 192 in Midway. The Gadsden location is close enough to continue to serve local Tallahassee customers, but situated near I-10 and U.S. 90, it will bring in new business, as well. Midway’s Four Star Freightliner services Freightliner and Western Star commercial vehicles as well as any truck with an automatic transmission. After almost 18 months of building — hammering out an agreement to buy the land, making agreements about roads and utilities, and constructing the site — Four Star Freightliner opened in Midway in March of this year. Kocan had anticipated making a $2.5 million capital investment in the new site, but construction far exceeded that estimate. “This is my first store that I built new, and when you build things for the first time, you learn,” he continued, adding that so far, the move to Midway has been worth it. “I can’t buy enough billboards to accomplish what I have by opening next to the interstate,” he said. Four Star Freightliner’s Midway location was made possible by cooperation between the Florida Department of Economic Opportunity, Gadsden County and the Gadsden County Development Council. The Tallahassee staff of 21 employees moved to the new location, and the company plans to make several new hires to accommodate increased operations. The site is bigger, too — 30,000 square feet where Tallahassee had been 20,000. In this way, Four Star Freightliner in Midway is positioning itself for growth. The new dealership also includes a classroom that will function as a diesel college for Gadsden County, staffed by a certified trainer and with classes beginning this fall. Kocan said he has been working with Dr. Sylvia Jackson of Gadsden Technical Institute to develop a training program. “In this industry, someone can get up and running pretty quickly and earn money. 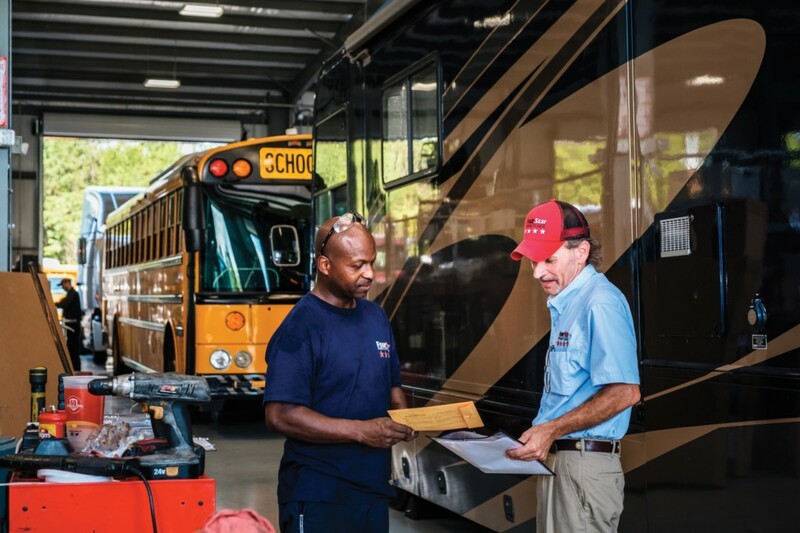 Technicians are highly compensated,” Kocan said, noting that the average diesel technician with five or more years’ experience can make $80,000 a year or more. This kind of investment in people is central to Kocan’s business model. The Midway move was only possible, he said, because of the strong team he has in place in Florida. “I wouldn’t make investments like this if I didn’t feel good about my team. We keep growing because we have a good product and we have outstanding people,” he continued. Following his Florida strategy, Kocan moved the Valdosta location closer to the interstate this past summer. A new Four Star Freightliner dealership is planned for Valley, Alabama, in 2019. Kocan said he’s never forgotten the lessons he learned as an employee at a Volvo GM Heavy Truck store in Atlanta, where he worked as a sales manager. “I was an employee for most of my career,” he said. After buying shares in the Atlanta dealership, Kocan went into business for himself by purchasing two Daimler stores in Alabama, bringing them together under the Four Star Freightliner brand in 2000. “My front-line people talk to more customers in a month than I do in a year. If employees have a good feeling about who they work for, they’ll show that to the customer,” he said. Of course, you need to get those customers in the door first. For the truck driver who needs service, Four Star Freightliner in Midway is a welcome sight.